Thought i’d put you all out of your misery with this one. Thanks for the guesses so far, and i’m not at all surprised that no one got the right answer. This pose captures the bird in a very unusual postion, and one that i think allows the white underside of the primaries shine through to the upperside, giving the impression of a large white patch on the upperwing. 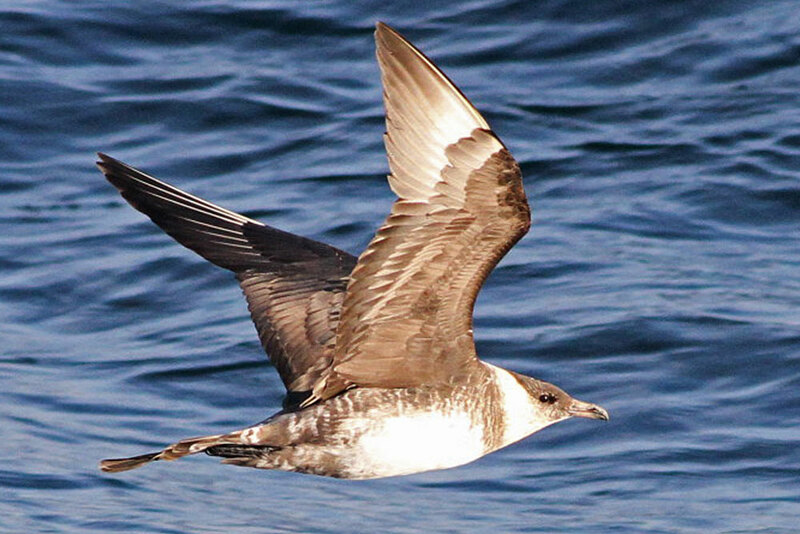 It is in fact, a ….. Long-tailed skua. 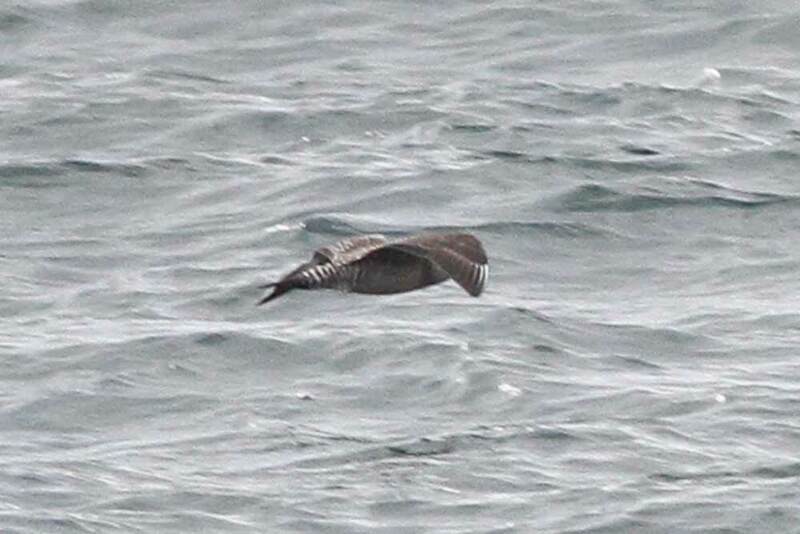 This shot shows the upperwing how it really was, with white limited to the shafts of the outer two primaries. The strong barring on the uppertail is also evident. And here you can see the obvious head of a juv Long-tail, with that real cold grey colour, although again the white on the upperwing looks to be real! It could be a lighting effect as much as the underwing shining through to be honest, but this was one of the most obvious Long-tails i’ve seen in the field, and i didn’t notice any excessive white until it landed on the sea and spread the wings like that. 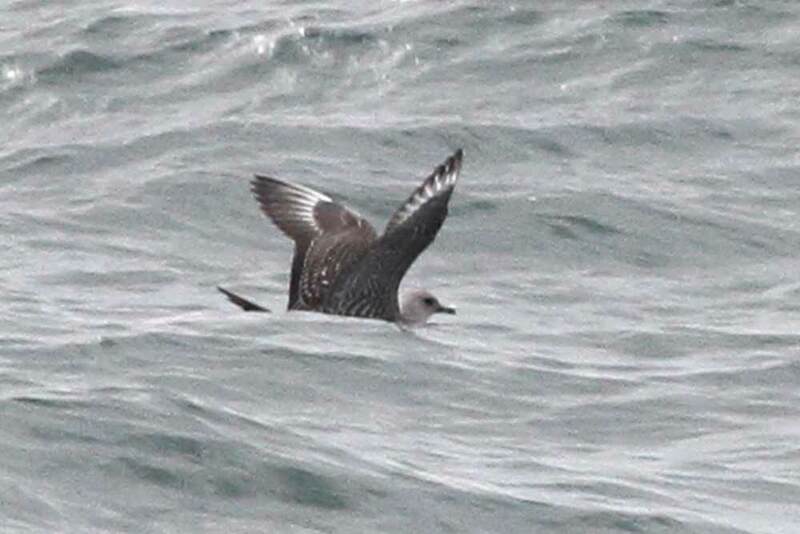 Just for fun, he’s a shot of a moulting adult Pom Skua also seen out in the North Sea recently. I think the solid dark underwing makes this an adult, but looks to have already gone through a partial body moult with those barred flanks and undertail coverts. Anyone have anymore thoughts on these two? This entry was posted in Identification, Skuas by Paul French. Bookmark the permalink. I forgot to reply and now you won’t believe me if I said I was going to say LTS!!! I thought the legs looked too long and thin to be a Pom!!! When you say underwing showing through I take it you mean the inner webs? As for the real Pom I’d agree it’s an adult in winter plumage.